It's a great day! I have learnt not to judge a day by it's weather , still, I am thankful for this cool and balmy weather. So, it is indeed a great day! I thank God for faith. It is a rare, yet, an essential virtue!. 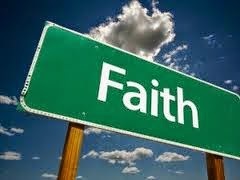 Faith is the driving force of life. It is the currency necessary for operating on a deeper and higher level of existence, faith is necessary for victorious living, it is the foundation and spring board for success in any venture. I thank God for this virtue. I am thankful for this great gift called Faith. It is what makes every day living possible and fruitful. It is the bridge between desire and fulfillment of goals and aspirations. As essential as it is, it exists in sizes and it grows, yet a tiny measure of it has great potentials and can produce amazing results. Faith is the source of all things.